Having the best gaming keyboard and mouse is every gamer’s dream. 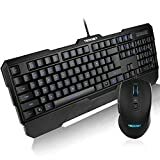 The perfect gaming keyboard and mouse should offer all the features they need and the price should be reasonable as well. There are different brands and models available for a gamer to choose from. The TeckNet Kraken gaming keyboard and mouse set not only offers great features but also comes at a very reasonable price. The keyboard and mouse are both designed to provide maximum comfort to the users. The keyboard comes with a wrist rest and has drain holes on the bottom. The mouse comes with a rubberized coating on both of its sides. It has the standard left-right buttons, two side buttons, and a scroll wheel which also acts as a button. There is also a DPI button just underneath the scroll wheel. The size and weight of the mouse are suitable for hands of different shapes and sizes. There are 3 different LED lights to choose from as your keyboard’s background lights. The backlights offer adjustable brightness, which helps illuminate the keyboard in rooms that offer little to no light. The LEDs also offer four modes: off, high, low and breathing. There are 12 keys dedicated to media only. You only need to press the right key to mute, play, skip, change the volume, or perform any other required action. There is also a Game/Desktop mode which, when enabled, disable the Window and Context menu keys so that you will never have to worry about the pressing the buttons that will disturb the flow of your game. The keyboard also has a wrist rest which makes sure that wrist pain doesn’t interrupt your long gaming sessions. The mouse and keyboard are designed in such a way that they provide maximum comfort, even during long gaming sessions. The mouse can measure a maximum sensitivity of 2000 DPIs. The sensitivity can be adjusted according to the need of the user. The mouse offers three sensitivity stages: 1000 DPI, 1600 DPI, and 2000 DPI. The rubberized side coatings on the mouse help you use it without getting tired. The mouse is designed such that it can be used by both left-handed and right-handed people. The position of the side buttons perfects quick switching and macro bindings. The DPI settings are very responsive and they can be easily changed to various speeds. However, the mouse does lack a button that could either disable the LED or change the color. The keyboard is easy to use, though many people are used to the UK layout and may face problems using the US layout. The keyboard also offers three LED modes for backlight which are red, blue, and purple. The light is bright enough to illuminate the keyboard, even in a room without any source of light. The keyboard keys are smooth and easy to use, but the dedicated media keys lack the dedicated volume, which might create convenience issue for some people. The drain hole at the bottom of the keyboard is a bit smaller than those offered by other keyboards. However, within this price range, there is no other product that will match the quality of this set.